← Le Vian Trunk Show! Have you ever searched online for that perfect necklace, only to be confused on the lengths? It can be difficult to judge what length the necklace is, if you can’t see it in person. 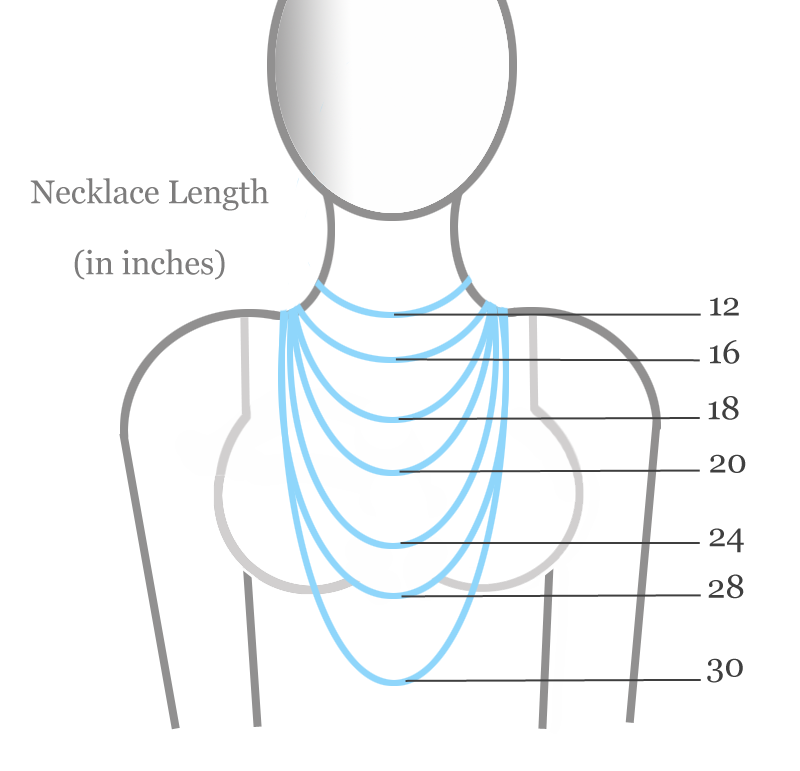 Here is a guide to show you where necklaces should hang on the average woman. Collar Necklace (12 in. )– Fits snug around the base of the neck and is usually appropriate for formal occasions. Choker Necklace (16 in. )– The choker necklace is slightly longer than the collar style, and it is sure to draw attention to your neck, or the pendant hanging from it. Princess Necklace (18 in. )– This length is great for every day wear, making it the most popular length choice. Add charms or pendants, or just wear this necklace size as is, to compliment any outfit. Matinee Necklace (24 in. )– This length falls around the bust line. Nice choice for evening wear. Opera Necklace (28-30 in. )- Great choice for formal wear, and it can even be doubled over for a more fun look. Rope Necklace (46 in. )- This necklace will fall around the waistline. It can be wrapped several times around the neck, giving it a lovely appearance. This entry was posted in Jewelry, Jewelry Guides, Jewelry Tips and tagged guide to necklace lengths, guide to necklace sizes, Jewelry, length of necklaces, necklace length, necklaces. Bookmark the permalink.